Florida’s naturally subtropical region, combined with climate change and a spike in our state’s population, has resulted in a water crisis that is reaching dangerous levels. In Central Florida, the threat is very real; roughly 90 percent of the region’s potable water is harvested from the Floridan aquifer, a finite resource. The Central Florida Water Initiative says that Florida is using as much water as it safely can from the supply and is taking as much water as the aquifer has to give. This begs the question: what can we do to meet our community’s needs while leaving the smallest footprint possible on our water supply? Roughly 3,000 gallons are spent watering each golf course in the U.S. every day, and the average Floridian consumes 124 gallons of water per day, half of which is used for irrigation purposes. Obviously, finding a more sustainable means of irrigation is a step in the right direction toward alleviating the stress we put on our water supply. Lakes of Mount Dora is a new 575-acre housing development located in North Lake County that is leading the charge in terms of water conservation. Lakes of Mount Dora’s planned unit development agreement requires that the development use the lowest quality of water available for landscaping and irrigation. To meet the terms of this agreement, the community was designed with a central irrigation system that uses reclaimed water from the city of Mount Dora as the primary source for irrigation of 183 landscaped acres throughout the community. To supplement the reclaimed water supply, a series of interconnected retention lakes were created. These lakes total 178 acres in surface and are strategically placed within the development. The final design demonstrates a water balance that is sensitive to the groundwater recharge area. Recharge is the primary method by which groundwater re-enters an aquifer. Lakes of Mount Dora currently has more than 800 irrigation zones and 16 controllers. Once the community is fully developed, there will be more than 2,400 zones and 24 controllers. 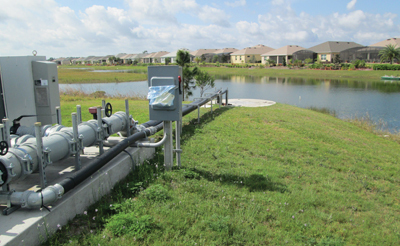 A master irrigation distribution system, connected directly to the reclaimed water from the City of Mount Dora, is used to supply the irrigation water to the community. 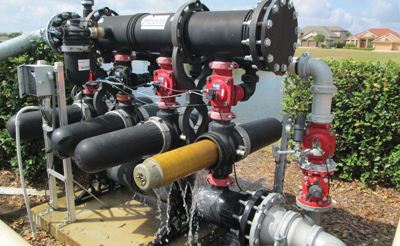 Two booster pump stations with a combined 2,650 gallons per minute capacity are used to both boost and balance the system pressure and maintain a steady delivery of water throughout the system. The community installed central filters to maintain the quality of reclaimed water that is distributed to the individual zones. Additionally, zone pressure regulators were installed to prevent over-spraying and fogging in an effort to ensure each gallon is used efficiently. The association retains a full-time, trained irrigation specialist on staff who manages and maintains the system, including programming the central irrigation system computer, analyzing daily reports, providing maintenance services, and monitoring the pump stations. The computerized central irrigation system utilizes a PC-based software package that makes control of a large-scale irrigation system affordable, usable, and comprehensible. The software contains interactive map graphics that communicate with each of the 24 controllers. 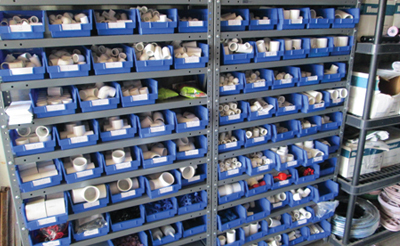 The controllers then communicate with each zone and the individual valves in those zones. This comprehensive system puts the Lakes of Mount Dora irrigation specialist in complete control of wide-area watering operations. Lakes of Mount Dora also handles all of the irrigation for residential lots and commercial areas. Educating and engaging the residents on water conservation tactics is crucial to the success of the program. Although water conservation is receiving increased attention throughout the state, the topic is not new to the St. Johns River Water Management District. Water supply utilities in the district are required to develop programs for the use of reclaimed water, and all consumptive use permit holders are held to the same standards of efficiency. New strategies and technologies were developed to bolster water conservation in the region, including educating the district’s residents. Lakes of Mount Dora also takes steps to spread water conservation awareness throughout the community via frequent posts on the community intranet. All residential plantings are low-to-medium water users, and bark mulch is used to aid in soil moisture retention. The homeowners association sets the irrigation watering days, times, and amounts. The watering schedule is split evenly over a Sunday to Saturday schedule to ensure a balanced application. The community maintains excellent communication with the city to account for changes in seasonal availability, maintenance, and/or downtime of the reclaimed water supply. Any community that is not fully developed should also maintain communication with the developer to coordinate irrigation and landscaping for future phases. Lakes of Mount Dora Community Association Manager, Cindy Pierson, comments, “Having a good system with the right staff and suppliers eliminates problems in the future and provides the community with a good-looking landscape while responsibly using our scarce resources.” Lakes of Mount Dora was awarded the Florida Communities of Excellence Trendsetter and Disaster Preparedness Awards in 2014 for their proactive and innovative approach to water conservation. Cindy Pierson is a licensed community association manager. She currently has five years of experience and is the active manager of Lakes of Mount Dora in Mount Dora, Florida. 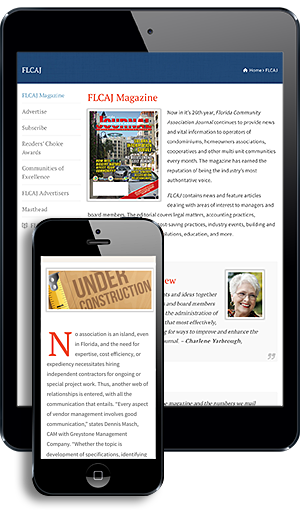 She is a Florida-born resident and has a degree in paralegal studies. Most of her experience has been in 55-plus communities. She has worked for Leland Management since 2015. Leland Management has been serving condominium and homeowners associations for more than 15 years. To learn more about Leland Management, call (888) 465-0346 or visit www.LelandManagement.com.